White and huge cliffs, turquoise waters, exotic places and an old cultural Bali, these are a few words that describe the marvelous natural paradise called Nusa Penida. It is a stunning island in Bali province and it has an expansion of 208,000 square kilometers. This Isle seems little in comparison with Nusa Lembongan or the bustled Bali due to its lack of buildings, restaurants, and nightlife which makes this place has an air from the 70 decade, but besides of all that, this is the perfect destination if you want to experience a weekend immersed in a natural environment. The strong smell of seaweed covers the island because of its coasts that are covered with it, and for that reason, it is the first economical source in the island. Nusa Penida is the home to two main towns, the town of Toyo Pakeh on the northwestern and Sampalan on the east. The center of the island is Taglad, which is about one hour by motorbike from Toyo Pakeh and here you will find friendly locals waving at you and some of them weave cotton fabrics called 'kain cepuk'. These types of weave are used for ceremonials and funerals. Nusa Penida affords you an unforgettable adventure and sceneries that feel like they were taken from a movie. With incredible landscapes and beautiful natural wonders, we cannot imagine that centuries ago Nusa Penida was used as a prison during the Gelgel dynasty, where many undesirable politicians and witchdoctors were banished here. Unlike Bali, known as the island of the Gods, this is known as the island of demons, earning a reputation as being not very good among the habitants of Indonesia. A legend tells that it was the home of the demon Jero Gede Macaling, which inspired the local dance called Barong. On the other hand, the island contains a sanctuary of its wickedness that today is used as a totem for those who have practiced the dark arts or for those who seek relief from them. 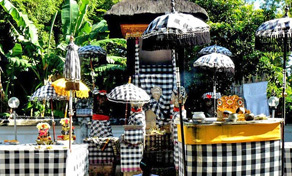 However, today the island has temples and ceremonies since most of its habitants are Balinese Hindus. 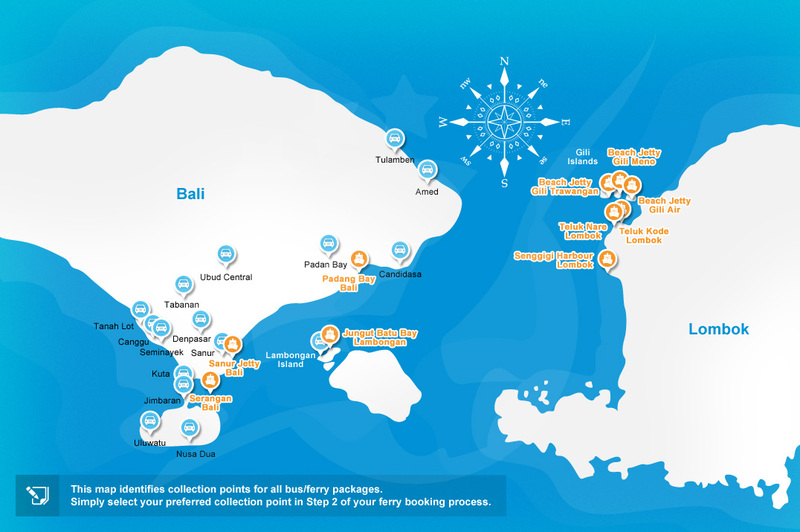 With around 20 diving sites, Nusa Penida is an ideal travel destination for those who love to practice this sport. You can find these dive sites along the coastal road, or also go to the fishing boats, however the most popular sites to practice this sport are Ped Toyapakeh, Gamat Bay, Ped, SD Point, Manta Bay, Mata Point and of course Crystal bay, when there is not much wind, you can access these sites by land. 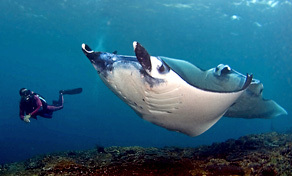 The favourite of tourists is the diving with manta rays that you can do in Mata Point, however you can also enjoy 247 species of coral and more than 500 fish, one of them is the Mola Mola fish, which can weigh up to 1,000 kilos, this huge fish lives in deep waters between 200 and 600 meters, but sometimes it can rise to be cleaned from parasites by other fish, this fish can be found between July and September. The island is covered with cliffs and large caves of limestone making it ideal for those travelers who are in search of adventure or for tourists who want to enjoy beautiful views of an impressive landscape, you just have to find the ideal place to enjoy a wonderful sunset. Undoubtedly, its beautiful landscapes will leave you with your mouth open in amazement, many of these cliffs have small stairs that will guide you to the top, just be very careful and use closed shoes. If you explore the caves of Goa Giri Putri, Desa Pakraman, and Karangsari, you will find magnificent stalactites and you will see beautiful hills and limestone rock formations. Walking about 10 minutes by Atuh beach, you will reach the top of a high limestone cliff, as well as a view of natural pools with crystal clear water and if you are lucky you will see some turtles and manta rays. This is the main attraction of Nusa Penida and the place where the habitants perform ceremonies. It is 30 minutes walking distance from Namaste and Warung CoCo or 30 minutes by motorcycle from Toyo Pakeh, also the beach has Ojek (motorcycle taxi) that can take you from Crystal Bay to your accommodation. This quiet place is the ideal place to relax, enjoy massages, have a refreshing drink and of course to view an unforgettable sunset. The quiet bay is surrounded by rock formations, has white sand and crystal clear waters as its name indicates and is the favorite place of many tourists who visit Bali, some take cruises or fast boats just to spend an afternoon enjoying these fresh waters.